I left the house thinking that I would just walk around the lakes, as usual. Then my iPod died. I had checked that it was fully charged before I left the house, and I didn’t get the “low battery” warning before it went silent, so I knew that wasn’t the problem. It was just dead. Walk out to London Drugs and get another one, I thought. And while you’re at it, get a few handkerchiefs at Mark’s Work Warehouse so you can throw out the ones that are at the end of their service life. So that’s what I did. 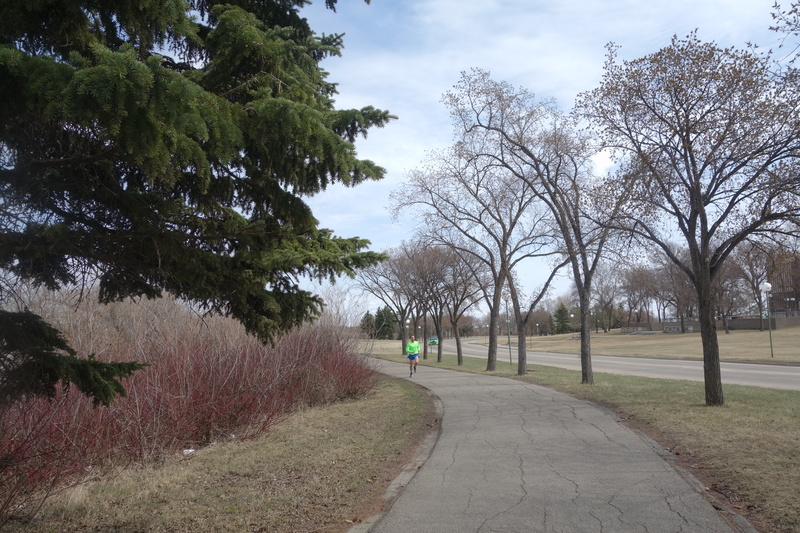 Through the park, over the Ring Road, and into the eastern big-box suburbs. 11 kilometres out, and 11 kilometres back. 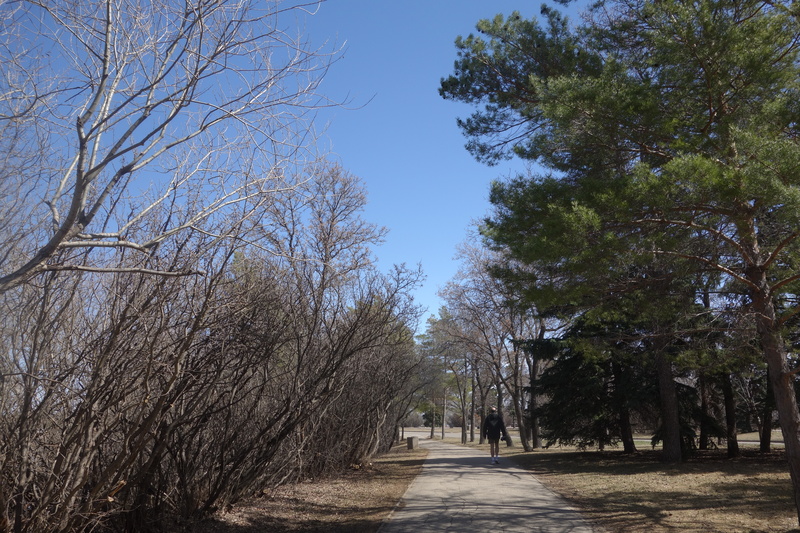 There were quite a few walkers by the lake, but by the time I left the park, I was pretty well on my own. 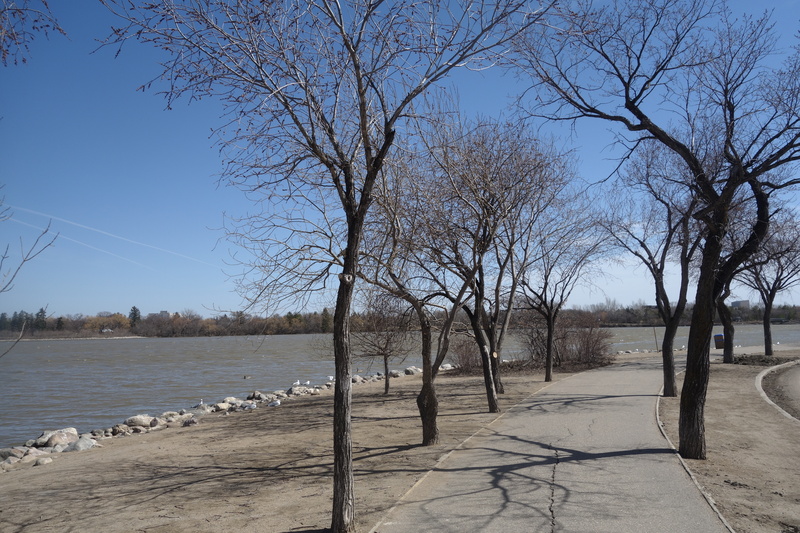 I like that gravel path, which runs along Assiniboine Ave. 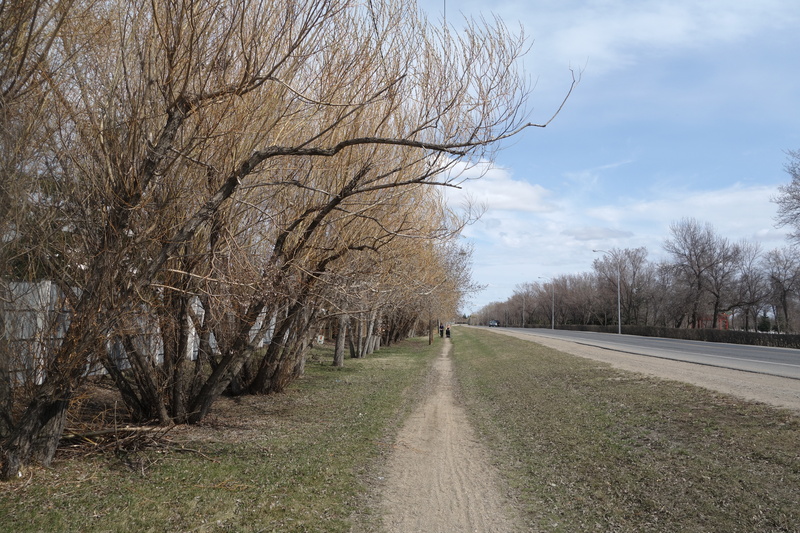 It reminds me of the sendas in Spain–footpaths running parallel to the highway. After 13 or 14 kilometres, I ran out of energy. I bought some trail mix at a drug store and ate it sitting on a bench. It didn’t really help, at least not right away, but I kept walking anyway. 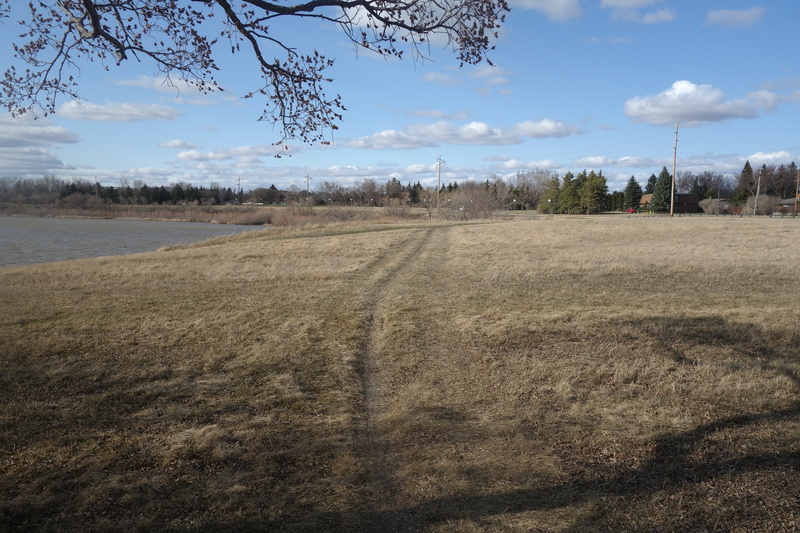 In the park north of the lake there are footpaths, which are a lot easier on the feet than the paved paths or concrete sidewalks elsewhere. And I like their informality, and the way they remind me of walking in England. And then home. I’m lucky to be able to spend five hours wandering around the city. I’ll be walking like a penguin tonight but it was a great way to spend the afternoon. 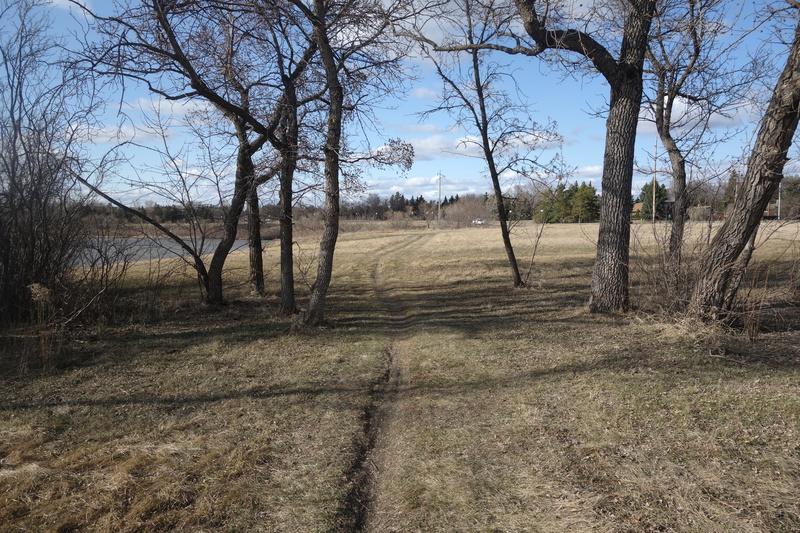 This path was covered in snow and ice not even two weeks ago. Now spring is definitely here. If you look closely, you can even see the whitecaps on the lake. A southeast wind, bringing warm temperatures with it. I went out for a walk later in the afternoon and saw three guys parasailing in the bird sanctuary. They shouldn’t have been there–there aren’t supposed to be any boats in the bird sanctuary–but they were having fun, and who could blame them? It’s finally spring. 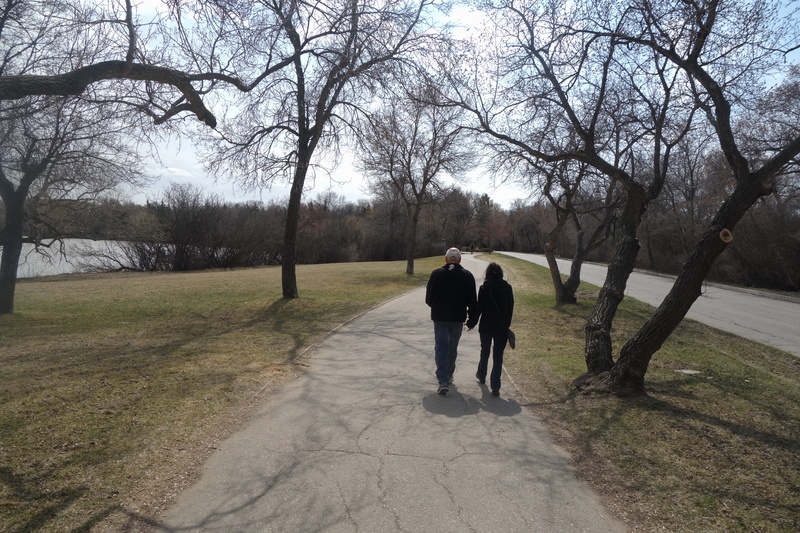 I wasn’t the only person taking a stroll through the park. Look! The grass is even starting to turn green. Okay, I admit it: I’m a little late to this party. We’ve been having this weather for days, but I’ve been feeling poorly and unfit for anything other than reading and looking out of the window. 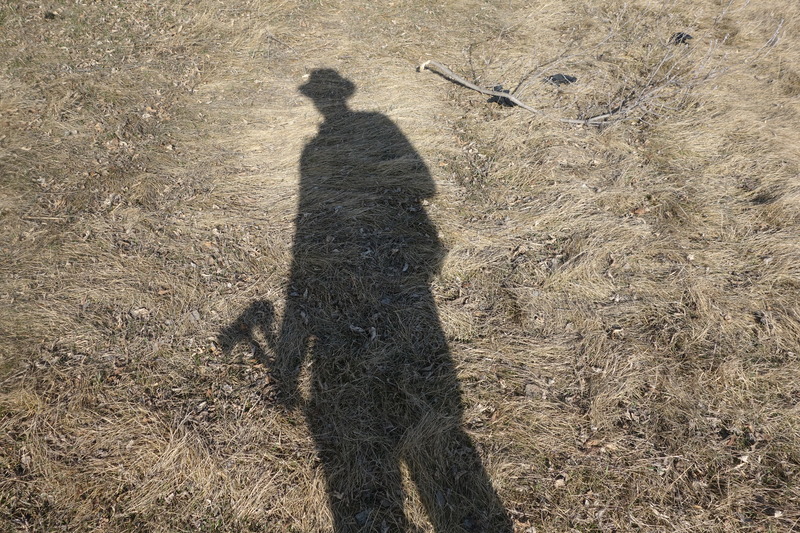 But I’m better now and thinking about a return to the Saw Whet Trail later this week, to see how it survived the winter. Let’s hope I don’t forget my camera. Another book about the Camino? Apparently, in spring a not-so-young man’s fancy turns to Spain–or there’s some unequal distribution in the pile of books I intend to read. I don’t remember getting this one, either, which might be a side effect of buying stuff on-line. 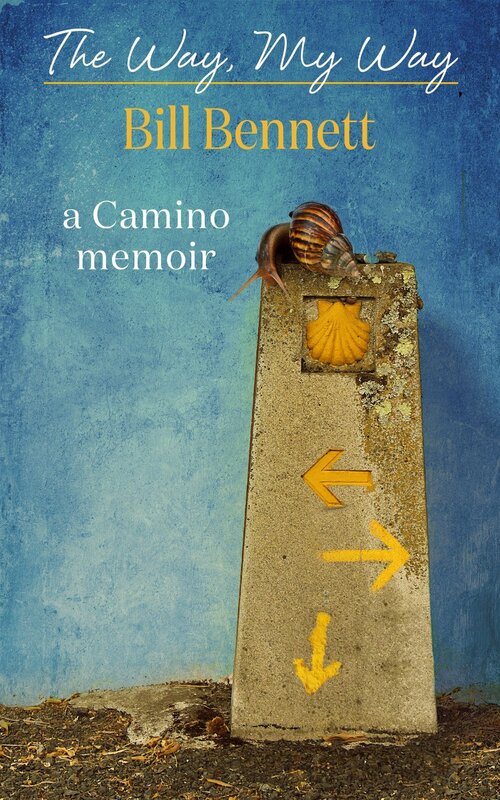 But it’s an excellent book–one of the best things about the Camino Francés that I’ve read. Robert Ward has walked the Camino Francés–the pilgrim path that runs between Saint-Jean-Pied-de-Port on the French side of the Pyrenees to the cathedral city of Santiago de Compostela in the northwestern corner of Spain–five times. He wrote this book after his fourth pilgrimage. This is his second book about the Camino; in his first book, he focused on stories about the Virgin Mary. In All the Good Pilgrims, the stories Ward tells are mostly stories about the people he met on the Camino, a cast of unusual and sometimes comical characters: Julio, the aggressive, wheel chair-bound pilgrim, and his sidekick, Paco; Tony, the Canadian who is celebrating the remission of his Hodgkin’s disease; María, the pensioner pulling her belongings in a bundle buggy; and Nuala and Kara, two British pilgrims who get into all kinds of odd scrapes along the way. There are plenty of other characters in the book; whenever Ward takes out his notebook, someone worth writing about comes into view. It helped me understand why some people will walk the Camino Francés multiple times, instead of trying some other path; that route is the one that most people walk, and the more people there are, the more stories you hear. Because he’s walked the Camino so many times, Ward knows where to stop and rest, and I particularly liked his accounts of the days he spent in Castrojeriz, one of my favourite towns on the meseta, the high plain in the middle of Spain. He also explains the strange Goose Game sculpture in Logroño–something I remember looking at and not understanding. In fact, Ward makes a number of suggestions about things to see and do along the way that would make any Camino a richer experience. 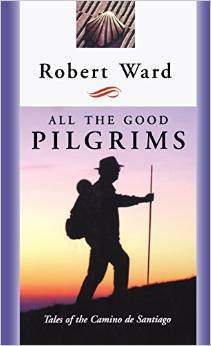 Ward also writes about things he learned during his pilgrimages, but since he is a seeker, not a finder, the book’s focus is on questions rather than answers. Given the temptation to assume that one’s pilgrimage will solve all of one’s problems, that approach is refreshing. But what makes this book unusual is the way it draws from multiple Camino experiences. Maybe you need to complete the pilgrimage multiple times to collect so many stories and characters. If you’re only going to read one book about the Camino, make it this one. Ward’s web site is here; a short essay he wrote about the Camino de Santiago is here. The essay is worth a look if you’re curious about the Camino or Ward’s longer account of it. Dan Rubinstein’s Born to Walk: The Transformative Power of a Pedestrian Act is both a memoir–the story of a middle-aged magazine editor, unhappy with his job, who takes up walking as a compensation and, ultimately, a new career–and an overview of walking’s potential to transform our lives. His thesis is that our species sole evolutionary advantage is our ability to walk upright, and the further we get from this primordial activity, the more messed up we become, individually and collectively. 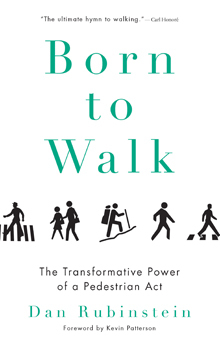 For that reason, Born to Walk examines not only the effect of walking on our bodies, minds, creativity, and spirit, but also its impact on society, economics, and politics. Born to Walk introduces us to a variety of walkers, including Stanley Vollant, an Innu surgeon from northern Quebec, who is leading healing walks between every Aboriginal community in Quebec and Labrador; Rory Stewart, a Tory MP from northwestern England who is famous for having walked from the Middle East to Nepal, including a trek across Afghanistan shortly after the NATO-led invasion of that country in 2001; and geographer Dave Sawchyn, who navigates Regina’s pedestrian-unfriendly streets on his way to work every day. We also accompany Rubinstein on a variety of walking journeys: on a pilgrimage along the Welsh Coastal Path to Bardsey Island, an ancient Christian site that’s reputed to be the burial place of 20,000 saints; across North Philadelphia with rookie cops assigned to walk a beat in one of that city’s roughest neighbourhoods; and on a mission to make his own Ottawa neighbourhood safer for pedestrians. The last is probably his most difficult and least successful effort. 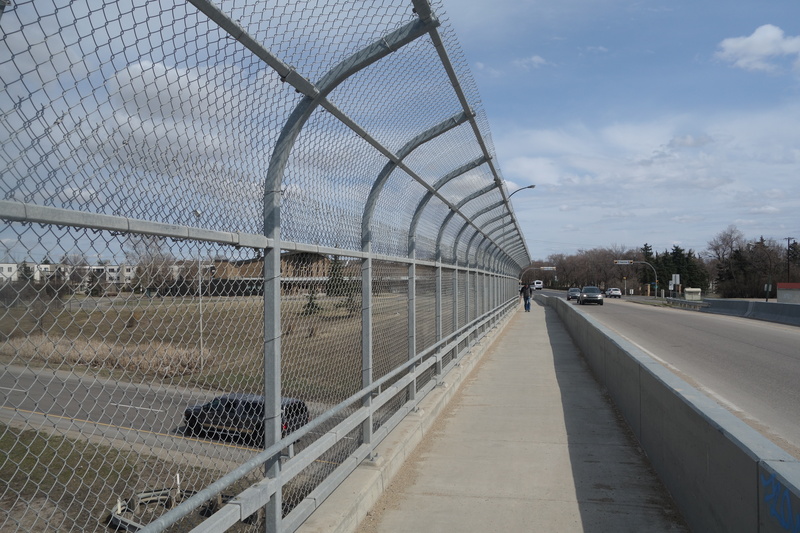 It’s hard to get city hall to pay attention to the needs of people who walk; it’s more concerned with what people who drive want. Rubinstein isn’t content to talk about walking in an impressionistic way. He discusses the hard sociological and psychological and economic data about the benefits of walking. 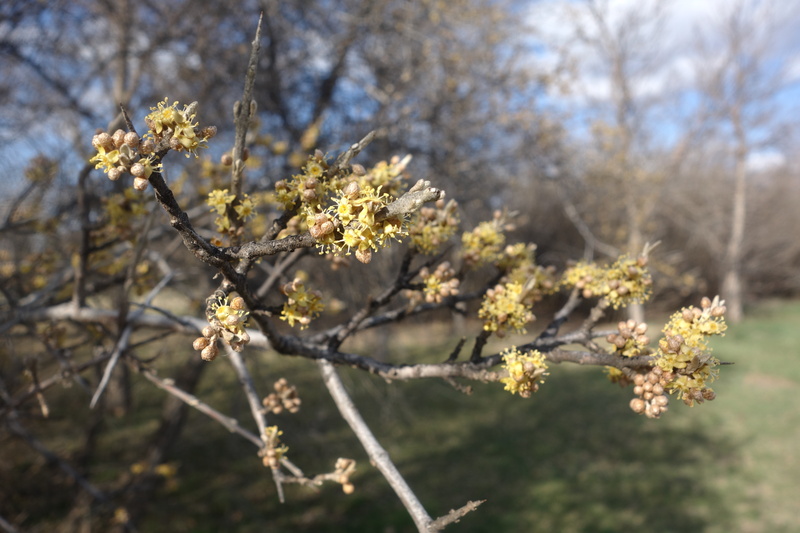 He discusses something Japanese researchers call shirin-yoku, or “forest bathing”: the effect of phytoncides–compounds released by trees–on the physical and mental health of humans. He describes WIAT, Woods In and Around Towns, a research program in Scotland that’s trying to figure out whether contact with nature helps Scots who are confronting economic or domestic difficulties. In fact, we learn about so many research studies that it’s hard to keep them all straight. It doesn’t really matter, because they all send a similar message: walking is good for us, and we’d all be better off, individually and collectively, if we walked more. For me, the most interesting parts of the book were Rubinstein’s original research–his stories about Vollant and Stewart and the scientists working on WIAT, and about his own walks in Canada and elsewhere. The literature review was less interesting, partly because his heavy reliance on writers like Rebecca Solnit and on Internet sources. Not that there’s anything wrong with Rebecca Solnit, or the Internet–I just got a sense that Rubinstein wasn’t adding much to what Solnit and others have to say, and that his use of Internet sources was somewhat uncritical. 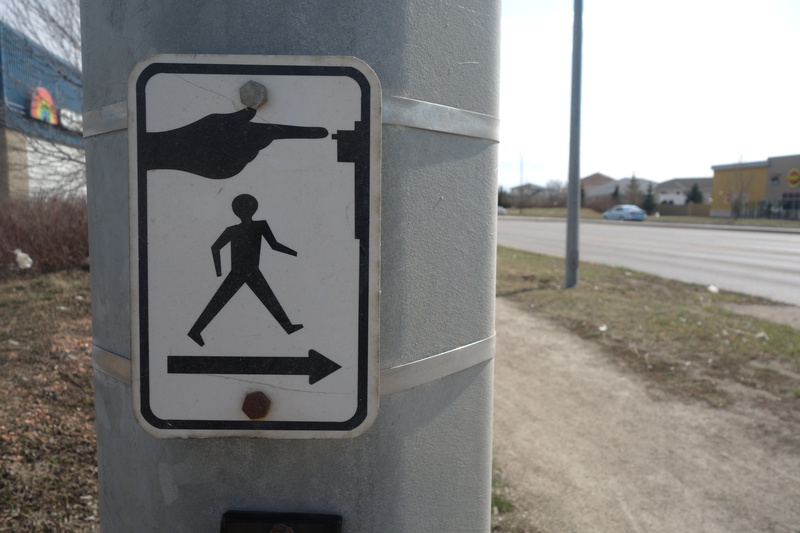 Nonetheless, Born to Walk is a good book–a worthwhile introduction to pedestrianism from a Canadian perspective and a useful overview of the ongoing research about walking. I particularly liked the way he put walking into a social and economic context. If you’re interested in walking, it’s definitely worth a look. You can find the Born to Walk web page here. For some reason, Australian filmmaker Bill Bennett’s self-published book The Way, My Way: A Camino Memoir was on the top of my books-to-read pile, which sits on a chair next to our bed. I don’t know why. If I had to guess, I’d say it was one of the books I sometimes buy to get an Amazon order up to $25 so I can claim the free shipping. Bennett walked in 2013, the same year I did, although he went in the spring rather than the fall. Immediately he ran into problems. He’d aggravated his knee on a training walk, and the long flight made it worse. When he got to France, he was barely able to hobble out of the airport. After his first day, his knee was the size of a football, and he was only able to complete his Camino by taking massive amounts of ibuprofen. He also had shin splints and a nasty infected blister that required medical treatment. But he carried on anyway, walking slowly and learning to trust something he called his PGS–Personal Guidance System–instead of worrying about mundane things, like where he would sleep that night. Eventually, of course, he reached Santiago de Compostela, where he was reunited with the people he had met along the way. Then he headed home, a wiser man for having completed his pilgrimage: in the book’s epilogue, he lists the things he learned during his walk. They’re all useful bits of wisdom, the stuff you’d hope to learn over the course of such a pilgrimage. The Way, My Way took me right back to my own Camino. Maybe it was reading the names of places I remember passing through or staying in. Maybe it was thinking about the friends I made and what I learned from my own pilgrimage, lessons about gratitude and the importance of creativity. I found myself wishing I could go back to Spain and walk the Camino again instead of enrolling in courses for the summer. I haven’t felt this way since I got back from Spain–I haven’t felt the urge to go back in the same way. It might be that this week I learned that one of my cousins died. It was sudden. He was working for an oil company in São Tomé and Principe, a small country off the west coast of Africa, and he had a heart attack. He was a year younger than me–married with a new baby girl. Although I hadn’t seen him in years–decades, really–I have happy memories of him. Of course, his death has reminded me of my own mortality. I don’t suppose that’s unusual. I’ve been wondering about how much time I have left, and whether I’ll be able to walk the Camino again before it runs out. I hope so. I have a feeling that I have a few lessons I need to relearn before I go.